Also available in Spring Blossom and Fresh Linen. 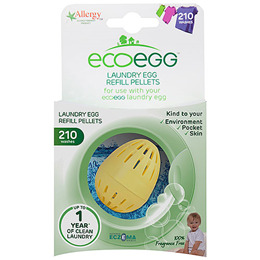 The Ecoegg cleaning pellets are non-toxic and do not contain any harsh chemicals, petrochemicals, enzymes, optical brighteners or phosphates. Contains: > 30% Anionic surfactants, 15%-30% Non-ionic surfactants. Below are reviews of Ecoegg Laundry Egg Refills Fragrance Free - 210 Washes by bodykind customers. If you have tried this product we'd love to hear what you think so please leave a review. Love this product. Great for bedding and towels. No itchy skin or eyes from this product. I have a septic tank so need natural cleaning products no chemicals. This is ideal and so easy to use. Have used these for many years. Excellent.